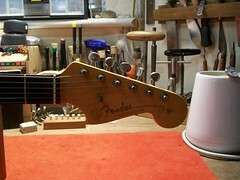 This old Fender Jazzmaster is in the workshop for a setup. It was made in 1964 and is in extremely good condition considering its age. I think it may have had a new paint job sometime in its life, nonetheless, it’s great to see this vintage gem in the workshop. Debuting at the top of the line circa late 1957, the Jazzmaster was another well thought out Fender, an impressively cohesive design that marked a significant turn from the Stratocaster. Though its historical significance and long-term commercial success was eclipsed by the Telecaster and Strat, it enjoyed a substantial popularity through the surf music era of the early 1960s. 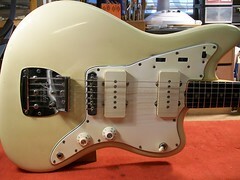 Like all previous Fender designs the Jazzmaster was an all-new guitar and the first model with an offset waist. 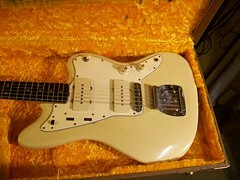 This diagonal perspective was extended to the pickguard and body, and overall the Jazzmaster design was a bold shift away from the symmetry of prevailing guitar aesthetics toward the modern art/liquid sculpture styling that remains a Fender hallmark. Another Jazzmaster innovation was the Trem-Lock button located at the tailpiece. 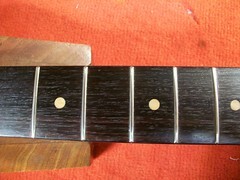 It locked the vibrato assembly and was intended to avoid a detuning should a string break. 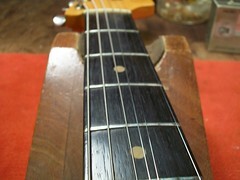 The bridge was mounted on twin posts, each with an adjustable Allen screw that permitted height adjustments and allowing the bridge to rock when the tremolo arm was depressed. The Jazzmaster’s pickups had single fat coils of wire, this gives them a warmer tone without losing their single coil clarity. 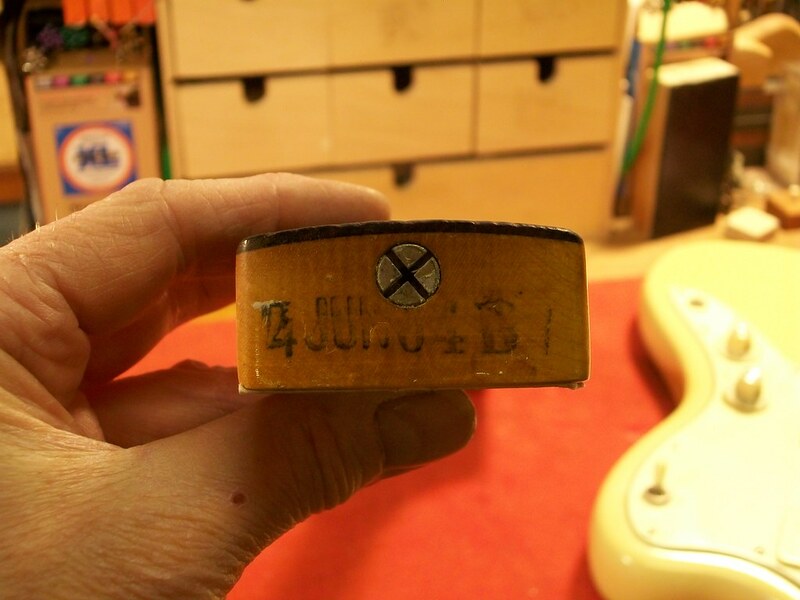 The circuitry was also new, incorporating two independent systems: a selector switch, volume roller knob, and tone roller knob were mounted inconspicuously on the bass side. 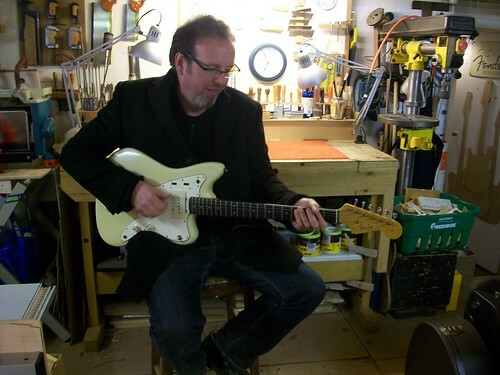 The guitar is given a Workbench Assessment and all that needs to be done to bring this old beauty up to optimum playability is a light Fret Hone and Re-profile.